Of all the things that come to mind when someone says “Ohio,” castles are not one of them. That is, of course, unless you’ve driven through Loveland, Ohio. Bachelor Harry Andrews apparently had an active imagination. First, he formed a group of young men in his Sunday school class (which he taught for 30 years) into the Knights of the Golden Trail, a Boy Scout-type brood that he met with on a regular basis. Then, he spent more than 50 years building a medieval castle for these Knights. They were a group formed primarily to contribute to the bettering of the world, the state of which Andrews felt was heading quickly downhill in a cloud of decadence, self-interest, and bad manners. To those who knew him, Harry D. Andrews was always a bit of an eccentric. Born in New York in 1890, Andrews would eventually come to make Ohio his home after returning from a tour of duty as an army medic in Europe during World War I (opposed to modern weaponry, but not warfare itself, he was a conscientious objector). It was during his tour of duty that Andrews fell in love with the castles of Europe, particularly those in France. So deep was this love that upon returning to the US, Andrews set about making plans to build his very own castle. So, armed with a reverence for times gone by and a profound admiration for Medieval architecture, in 1929 Andrews began building a full-scale replica of a Medieval castle—a tenth-century Norman-style castle, of the type that would have been home to a knight, to be exact—which he named Château Laroche, French for “stone castle.” Over the next few decades, Andrews would devote his entire life to building the castle. Almost single-handedly, Andrews carried literally tons of stones (in an estimated 56,000 five-gallon pails), many of which he pulled out of the riverbed of the Little Miami River nearby. Andrews even went so far as to make his own bricks by pouring concrete into old milk containers. Andrews considered Château Laroche to be his life’s work. And indeed it was. He worked on it every weekend until he retired in 1955, when it became a fulltime endeavor. Sadly, Andrews passed away in 1981 before construction was officially completed—a trash fire he set on the castle grounds got out of control and burned him severely, and he later died from the injuries. Still, the castle Andrews left behind boasts over 15 rooms, including a great hall, a banquet hall, an armory, a bedroom for Andrews (who lived there), a watchtower, and even a dungeon with cells. Terraced gardens complete with hothouses for growing flowers and vegetables in the winter surround the castle, which sits on an acre and a half of land. Lending credence to its status as a “true” Medieval castle, Château Laroche lacks indoor plumbing. There is no question that the castle is fit for the knights it was meant to house—its very specific dimensions and details were intended to ensure that it was a bona fide fortress. Andrews, with little faith in contemporary society, built an ax-proof door spiked with more than 2,500 nails and over 200 types of wood (cobbled together so that the grain runs in various directions, making it hard to chop through). A “night door” was also added to the main entrance—night watchmen would open this four-foot high door for visitors, who would have to bend over to fit through it, putting them in a vulnerable position. Battlements, where defenders of the castle would historically take up arms against intruders, even adorn the castle’s third floor, and a rooftop fireplace has side pockets for melting lead (in Medieval times, knights would have poured hot molten lead into holes above the main entrance while defending the castle; Château Laroche has seven such holes above the front door). 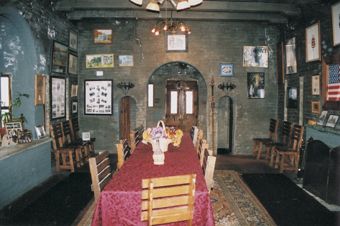 Château Laroche is a local tourist attraction now and it is open to the public. 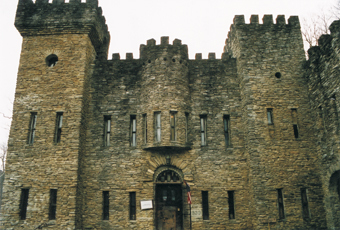 It has been renamed Historic Loveland Castle and is touted as the world headquarters of the Knights of the Golden Trail, a group of Medieval re-enactors who meet monthly, dress in chain mail and armor, and address each other as "Sir So-And-So" (“Sir Harry” Andrews willed the castle to the group, so it passed to them when he died). The grounds are beautifully manicured by a group of volunteers (mostly knights sans armor) and feature a rock garden with a Loch Ness-type monster swimming through the pebbles. Although he never married, Andrews received (by his own account) more than 50 marriage proposals from women who wanted to live in a castle. Ironically, Historic Loveland Castle is now a popular place for weddings. The castle’s website nonetheless points out that wedding-night rental is not available. But what about wedding knights?